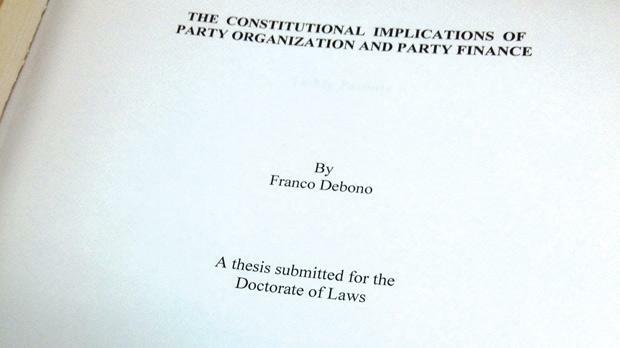 Some arguments made by Franco Debono in his doctoral thesis contradict his actions today. 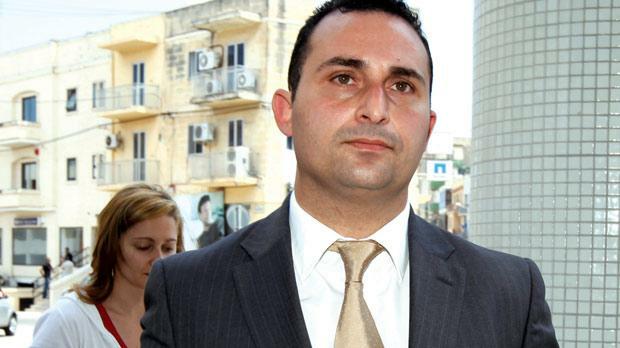 Renegade MP Franco Debono has admitted parts of his University thesis may contradict his actions today but argues that desperate times call for desperate measures. Blogger Nicky Azzopardi this week fired up the blogosphere by publishing extracts from the thesis that jar considerably with Dr Debono’s recent actions and declarations. Dr Debono, a government backbencher, says he lost confidence in the govern­ment, primarily because failing ministers were promoted not sacked. When contacted, Dr Debono said many quoted extracts were simply “generic academic statements” and his thesis only proved such issues were always close to his heart. “Of course MPs should be extremely reluctant to vote against the government,” he said, “that’s how it should work in an ideal model, where parliamentary democracy is functioning healthily. “But I think there are grave deficiencies in our system. “If these were frivolous issues, it would be fine but we’re talking about the fundamentals of democracy,” he insisted. Dr Debono’s 1999 doctoral thesis contains chapters dealing with discipline, candidate selection and ministerial responsibility. Interestingly, it speaks about governments turning into “oligarchies”, which is what Dr Debono claims happened to the Lawrence Gonzi Administration. It also speaks about the role of backbenchers and ministers and warns that Cabinet government has rendered Parliament “an impotent spectator” (see quoted extracts). Speaking to The Times yesterday, Dr Debono said the Maltese system was “not normal” and “very different from what you read in textbooks”. His battle to persuade the government to introduce the right to a lawyer for suspects facing police interrogation was a “perfect case study”. He had spoken both internally and in Parliament, calling for the law to be enforced. When nothing was done, he decided to abstain from a parliamentary vote. He said the prevailing circumstances in Malta were “exceptional” because the Prime Minister promoted ministers even when they did not have the support of a backbencher who was proven right on such issues. Dr Debono conceded that such issues had not sparked any protests in the country but said this was because the public did not understand their importance. Franco Debono is critical of those who suggested that governments should be given more seats in Parliament to ensure stability. “Too much stability is not desirable,” he said, adding that the most stable form of government is a dictatorship. The one-seat majority was a reflection of what the electorate wanted to see and had proven to be popular because it kept the government on its toes. Those who suggested otherwise were “crawling out of democracy”, he said. Asked whether he would stop “teasing the country” (as argued editorially by The Sunday Times) and clearly declare how he would vote in next week’s motion, he said the government was the one teasing the country when it wanted no time limit for the debate on the motion. He added that he had already declared his intentions and nothing had changed since then. ☑ “Michels persuasively argues . . . that the true aim of party leaders is often not that of pursuing the declared objectives for which the organisation was established but, rather, of ensuring the organisation’s survival and, with it, the survival of their own power positions . . . Whenever their decisions are challenged by the rank and file, they threaten resignation, which is “an oligarchic demonstration, the manifestation of a tendency to enfranchise themselves from the control of the rank and file”.